1. Make just enough and everyone is happy and full. 2. Make way too much and have lots of leftovers. In a large bowl, sift together the flour, baking powder, salt and sugar. Make a well in the center and pour in the milk, vanilla, egg, and melted butter; mix until smooth. 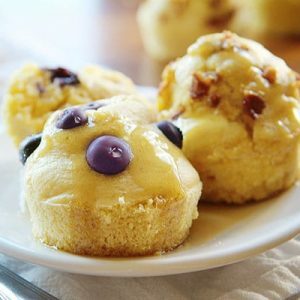 Using a 1/4 cup as a scoop, put batter into a muffin tin that has been greased/sprayed/buttered. Choose your garnish (fruit, bacon, egg, chocolate chip) and use about a tablespoon for each muffin. Be sure to press the garnish down into the batter. Best served warm and with syrup.